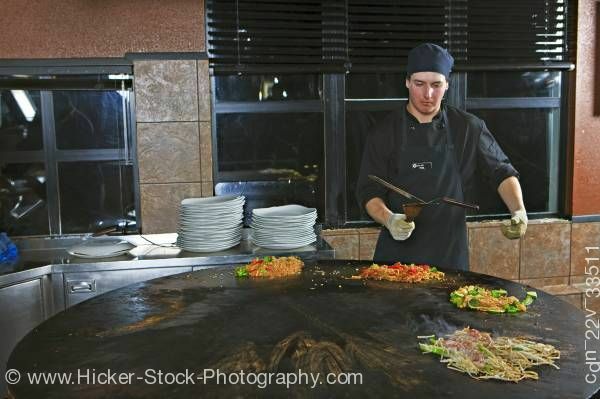 Stockphoto of a chef performing with utensils while preparing meals at the Mongolie Grill World Famous Stirfry Restaurant in Whistler Village, British Columbia, Canada. This stock photo includes a chef performing with utensils while preparing meals at the Mongolie Grill World Famous Stirfry Restaurant in Whistler Village, British Columbia, Canada. Property Released. This unique restaurant encourages you to pick your own combination of fresh vegetables, meats, and seasonings, from which they will create before your eyes your personal stirfry meal. Independently owned and operated since 1996, the Mongolie Grill has developed into a World Famous dining experience. Since day one, owners Chris Miron, Andrea Volker and the Volker family have stayed true to their goals for the restaurant; to become a Whistler favorite while maintaining the perfect balance of a fun atmosphere, great service, and excellent food. Located in the heart of gorgeous Whistler Village, and with well over a million served now, the Mongolie Grill has separated itself from other "Mongolian" style restaurants, to truly become a World Famous dining experience.